Conservative party leader Theresa May has signalled she will use her right as incumbent to make the first attempt to form a government, but it is unclear whether she will have the necessary support to do so. 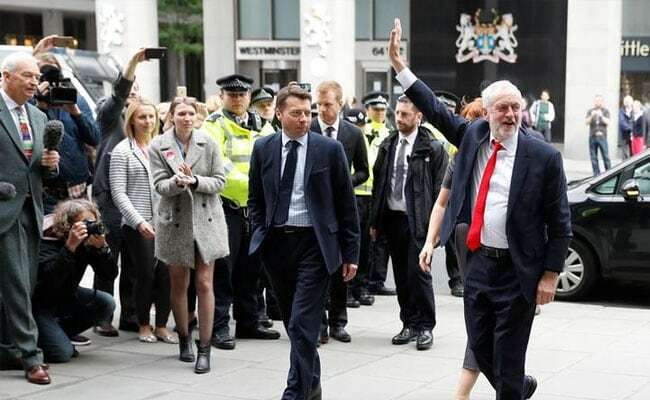 Labour Party Leader Jeremy Corbyn, arrives at the Labour Party's Headquarters in London. London: Britain's opposition Labour Party will put itself forward to lead a minority government after Prime Minister Theresa May's Conservatives failed to win a majority in a national election, the party's finance spokesman John McDonnell said on Friday. May was fighting to hold on to her job on Friday as British voters dealt her a punishing blow, denying her the stronger mandate she had sought to conduct Brexit talks and instead weakening her party's grip on power. May has signalled she will use her right as incumbent to make the first attempt to form a government, but it is unclear whether she will have the necessary support to do so. "We'll put ourselves forward to serve the country and form a minority government and the reason for that is I don't think the Conservative Party is stable, I don't think the prime minister is stable. I don't want to be derogatory but I think she is a lame duck prime minister," he told BBC Radio. McDonnell also said Labour would not do a coalition deal with any other party.